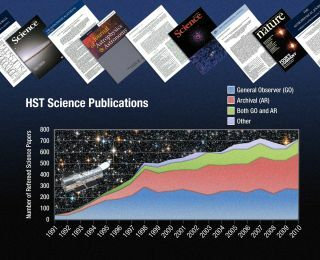 NASA's Hubble Space Telescope has passed another milestone in its 21 years of exploration: the 10,000th refereed science paper has been published. This makes Hubble one of the most prolific astronomical endeavors in history. The famous Hubble Space Telescope has crossed a major milestone, accumulating 10,000 science papers based on its observations. After 21 years of taking stunning pictures of the heavens, Hubble has established itself as one of the most prolific astronomical endeavors in history, NASA announced. Though the observatory is getting long in the tooth, it's actually in the best shape of its life, scientists say, because it has been repeatedly upgraded by astronaut servicing missions that outfitted it with new and improved instruments along the way. The fifth and last space shuttle servicing mission was in May 2009. Papers describing discoveries in nearly every field of astronomy and cosmology have been published based on data gathered by the Hubble Space Telescope. These studies were conducted by scientists in more than 35 countries, with the most papers written by researchers in the United States, the United Kingdom, Germany, Italy, France, and Spain. The 10,000th Hubble science paper was published by Zach Cano of Liverpool John Moores University in England and his colleagues, NASA officials said. Cano's paper announces the discovery of the faintest supernova ever associated with a cosmic explosion called a long-duration gamma-ray burst, which spews high-energy radiation into space when a star dies. The first space science paper based on Hubble data came about six months after the telescope's launch on April 24, 1990. On Oct. 1 of that year, Tod Lauer of the National Optical Astronomy Observatory in Tucson, Ariz., submitted a paper on observations of the center of galaxy NGC 7457, where scientists suspected a huge black hole lurked.